This quiet book page I am really excited about. This is going to be a dog house page, which will have a few different breeds of dogs she can choose from to put in the dog house, feed him his food or give him his bone when he does tricks. Here's the pieces to get you started: green grass, bone (2), dog dish, food, dog house, triangle roof, dog house door, a box and lid for storing dogs and a piece of ribbon (not shown). Next, you need to prepare the bone. First, I glued on the ribbon to one side of the bone. Let it dry completely. Went back and sewed the matching bone on top. Then you just start sewing everything on the page. First the grass, then place out the dog house, dish and storage box. Make sure you have everything in place where you like it. Pin it. 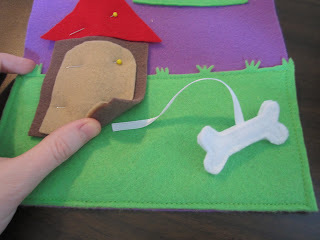 Then place the ribbon under the right side of the dog house and sew over it as you sew on the dog house (actually I think I even glued it ahead of time a little bit just for added reinforcement). Next sew on the door and roof to the house. For added dimension I only sewed on the dish and not the food, so they can lift it up so it's kind of 3D because I figure they won't always hold their dog flat on the page. I love it! I love dogs and my children too!